After Demons of the Punjab I wasn’t quite sure how the show was going to keep the momentum going, with this episode initially feeling a lot more plain stupid than it ended up being, but they really did a good job this time. The plot this time saw the team being summoned to space Amazon where the workers now number only 10% of the company while automated machines do the rest, initially fearing that “The System” is killing off human employees. What could’ve been a very good if standard story over worries of “big tech” and automation putting people on the scrapheap is instead twisted at the last minute, with clumsy janitor Charlie being revealed as a trade unionist where all means are justified where he plans to murder thousands in an effort to portray automation as evil. I really enjoyed this twisting of the moral message into a greater one about misuse of technology, where both the corporate machine abused its staff for so long and focused more on efficiency drives that the AI now controls the workplace so much even the managers don’t know what’s actually going on and Charlie’s extreme “pro-human” views are forwarded with his abuse of the system to turn innocuous bubble wrap into bombs. It’s a twist that’ll no doubt get them attacked from both sides as being too corporate or not corporate enough but I commend them for taking the risk. This message is wrapped up in a tale that still manages to remain somewhat humourous and this feels deliberate, with the almost whimsical friendly music playing as creepy posters of the Kerblam! robots are all over the walls behind them, and there’s a great focus on lighter moments that has fun with the setting, a memorable scene being as Yaz and Ryan flying through the delivery chutes that go on for miles. It all builds to what must be a deliberately almost meta style that has the episode still being clean and sterile corporate-friendly while people are blown up in the background. The episode also featured an abundance of references to both the Tennant and Smith eras, with the Doctor wondering if they can still pull off a fez while she also makes references to The Unicorn and the Wasp from Series 4 along with RTD’s obsession with characters having the names of common phrases. This is the first time in the new era that it’s really bothered to reference previous NuWho but it manages to thankfully walk the line between niche and too obvious. If there was one aspect of the episode that was a bit disappointing it was the lack of use of their star guests, with Lee Mack’s father character appearing for all of 10 minutes before being murdered while Julie Hesmondhalgh (famous in the UK on the soap Coronation Street) feels rather wasted in what was an interesting HR manager role, caught between being too chummy and callous at the same time. 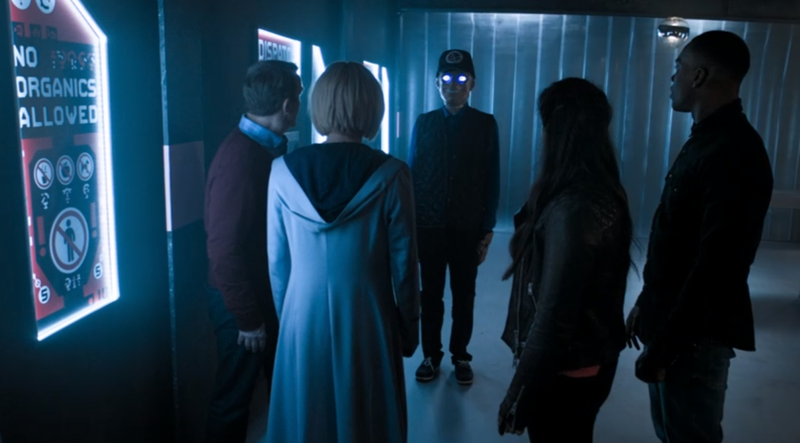 In the end however this remains a great little episode, yet another episode that’s showing that what Chibnall seems to lack in writing episode’s he more than makes up in bringing in new talented writers to do their own stories with no forced arc.